Although most of these items could badly use a re-mastering, there's no questioning the importance of Toscanini's work with the BBC Symphony Orchestra. While most of his legacy rests on his extensive work with the NBC Symphony Orchestra in New York, ultimately, I find his recordings elsewhere to be more satisfying. Consider the Philadelphia Schubert "Great" Symphony, the Philharmonia Brahms cycle on Testament, or any of his indispensable readings with the New York Philharmonic. To this list, we can now add the BBC Symphony recordings which began in 1935 and concluded in 1939. Each selection testifies to the extraordinary vision of Toscanini. Collected together for the first time, these recordings matter. Most if not all this repertoire can be heard in better sound from the Maestro's years with NBC, but not necessarily in better interpretations. Mine may be a minority view, but I dislike the RCA Brahms cycle and find it lacking in both polish and warmth. Regarding the Fourth Symphony, there are many versions to choose from, but I may like this one best. Another excellent alternative would be the NBC broadcast once available on the "Great Conductors of the Century" line. The Second always did bring out the very best in Toscanini – and is probably the finest pick of that RCA cycle – so this BBC version is unsurprisingly terrific. I'm a little surprised there's no Beethoven Fifth here (I would have thought it a great commercial success), but we do get a fine version of the Seventh. It may not surpass the famous New York Philharmonic version, but it's still very good. This "Pastoral" takes a while to come together (it was also on the "Great Conductors" set), but has a notable charm and briskness. As for the First and Fourth, these for me prove far superior to the better-known RCA studio recordings. Conversely, even for RCA, Toscanini's Wagner reigned supreme, and these three selections confirm an already accepted mastery. Outside of Beethoven, Brahms, and Wagner, a few major works remain. The Elgar was coolly received by the British press, but so is most Elgar conducted by foreigners. It sounds fine, and is an important recording. So too is the Sibelius, although sonically it's terrible. La Mer – a specialty that he recorded several times – sounds great consideringthe date, and all of Toscanini's Debussy is worth hearing. The rest of the set is devoted to short pieces, and I wouldn't want to be without any of them. Sure, the Mendelssohn selections lack the razor sharpness of New York, but perhaps no one ever conducted these better. Ditto for Rossini, another composer the Maestro basically owned. The Brahms and Beethoven overtures are great, and the Mozart and Weber are just as fine. The BBC Symphony Orchestra does not play flawlessly. There are issues outside of the slightly creaky "Pastoral" that astute listeners will doubtless notice. Still, Toscanini was apparently happy, and so was the orchestra by all reports. One wonders what might have been if the Second World War had not prevented further projects. The recordings, a mix of live and studio takes, could use some loving care in the future. These recordings are old, and already Toscanini was aging. But he was still in total command, and here at least he had an orchestra mostly capable of giving him what he wanted. 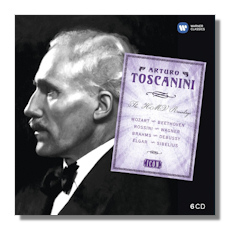 If you – like me – don't hear much that's special in the NBC legacy on RCA, you might find this set your way in to the Toscanini fan club.